Walrus Ice Cream offers on site catering for parties of 100 or more. Want to celebrate your staff, surprise your wedding guests, celebrate a birthday, anniversary or Bar Mitzvah? Lets us do the heavy lifting and give you all the credit. For $5.00 a person we will provide 6 different flavors of ice cream plus 1 non-dairy option made from scratch. We include waffle cones, sugar cones and cups. If you choose to provide a Sundae bar for $5.50 a person, we will include Hot Fudge, Strawberries, M&M’s, Rainbow Sprinkles, Chopped Peanuts, Whip Cream and Cherries. These prices include set up, tear down, two people to serve and all the equipment needed for a successful event. Call us today at (970) 482-5919. 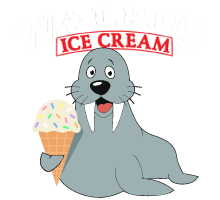 Copyright © 2016 Walrus Ice Cream. All Rights Reserved. | Website Designed by Sage Marketing Group, Inc.